This semester FSU BA Art student, Nicole Webber had the privilege to work with artist, Dr. Alan Pascuzzi, in Florence, Italy. Dr. Pascuzzi was born and raised in New York but studied abroad in Florence on the Fullbright scholarship where he studied Greek and Roman sculpture and Italian Renaissance art. He stayed in Florence to practice art as well as teach art history for various universities. Dr. Pascuzzi is not only well versed in Renaissance art, but the processes as well; he creates sculptures and paintings in the same processes that the art masters of the Florentine Renaissance. Dr. Pascuzzi’s art studio is located in the artisan district of Florence, which made Webber’s time there very surreal, as various sculptors, painters, woodworkers, and art restorers constantly surrounded her. During the semester she learned various Renaissance artistic practices such as fresco making, silver point drawing, pen and ink drawing, perspective drawing, and gold leafing. She often assisted Dr. Pascuzzi in his studio preparing for various art lessons he teaches to nearby schools and tourists throughout Florence. Dr. Pascuzzi is currently publishing a book, Becoming Michelangelo, set to print this coming fall; it is centered upon his own research of Michelangelo’s life and artistic process. Webber was able to photograph various important locations and hidden gems throughout Florence significant to Michelangelo’s life that will be featured in the book. She also photographed various sculptures created by Dr. Pascuzzi, based upon various biblical scenes of the Madonna and Child. The images were used for a show proposal at the Vatican in Rome, which was accepted and will begin this coming winter. The last photography project for her internship was for an iPhone application currently being developed. Dr. Pascuzzi along with many other art historians are contributing recordings that teach listeners about various works of art and architecture significant to their specialty. 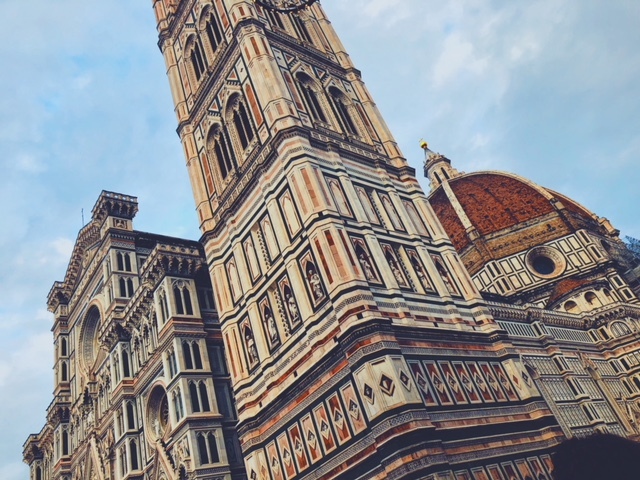 As Dr. Pascuzzi’s specialty is Florentine Renaissance, Webber photographed various works of art found in the museums, along with the many churches, of Florence. Her photographs will be published on the application to be seen while users listen to Dr. Pascuzzi’s lectures. Between helping in the studio and photographing for various projects, Dr. Pascuzzi had Webber write, illustrate, and print a children’s book, as she wants to become a children’s book illustrator after college. Her book is named, Lucky Little Orlando, and is based upon a medieval Florentine tale of a lion and a little boy named Orlando. Throughout her time there, she went through the entire process of writing, editing, illustrating, and producing a finished children’s book. Webber says this semester was more than she ever could of hoped for, given she was able to learn the process of developing a book, publish photography, as well as learn about Renaissance art first hand in the city it began in. She credits Dr. Pascuzzi for giving her much opportunity, knowledge, and experience- but most importantly, the most amazing semester abroad in Florence, Italy.